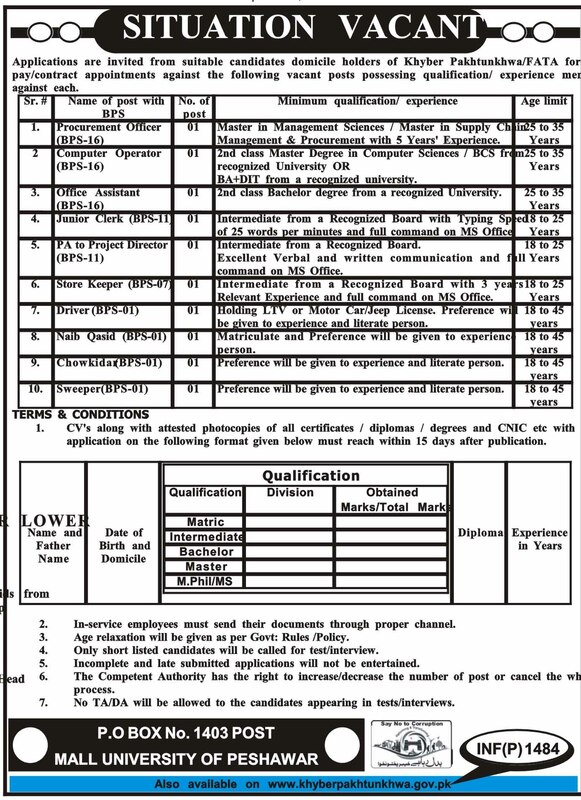 Post Mall University of Peshawar has announced 10 New Jobs in Daily Mashriq Newspaper 27th March 2018. Applications are invited from suitable Candidates against Jobs in Peshawar City 2018 from Domicile Holder of Khyber Pakhtunkhwa/FATA for pay/contract appointments against the following Vacant Posts possessing qualification/Experience Mentioned Against each Post. Procurement Officer, Computer Operator, Office Assistant, Junior Clerk, PA to Project Director, Store Keeper, Driver, Naib Qasid, Chowkidar and Sweeper.